We all have different strengths and weaknesses, young and old. And properly designed work should be safe and healthy whoever is doing it. So why are older workers told they are no longer up to the job? Hazards editor Rory O’Neill spells out the measures necessary to deliver healthier workplaces for all, regardless of age. • Improving health and longevity mean the great majority of workers have no significant health impediments to prevent work up to the age of 65 and for many, where they wish, beyond. • Workplace health and safety considerations are not a valid reason to prevent older workers continuing in work. • Age discrimination legislation can and should be used to challenge dismissal or failure to recruit or train older workers on spurious “health and safety” grounds. • If government targets for increased employment of older workers are to be met, it will require new “work ability” approaches from employers, including occupational health and safety programmes and workplace level “age management strategies”. These programmes should attract government support. • There is a case for introducing an explicit legal duty on employers under the Management of Health and Safety at Work Regulations, requiring assessment of jobs to see that job tasks take proper account of the physical capabilities of workers, with a particular focus on older workers and any possible adaptations, job redesign, changes in work hours or schedules or reassignment that might be beneficial. The UK already has a similar safety regulation tailored to younger workers. France has a law requiring periodic review of measures by employers to address the impact of physical strains at work on the employability of older workers, with an explicit requirement to remedy problems identified. • Age management strategies must target “ageing” rather than just “older” workers. Planning occupational health interventions and devising job redesign or alternative work in good time, with policies looking at workers in the 45+ age group, will provide greater scope for creating suitable and healthy work transitions. Career structures should allow a shift to more suitable work, where necessary or desirable. • Extension to older workers of the “right to ask” for flexible working arrangements would enable older workers to consider alternative work patterns better suited to their capabilities and responsibilities, including the possibility of “sunsetting”, a gradual reduction in work up to retirement. • Workers should not be denied safety or vocational training because of their age. • Payment schemes based on productivity should not lead to unhealthy work rates, or work patterns and speeds that disadvantage older workers. Pension schemes should not result in pressure to work longer hours in the years preceding retirement. • Older workers in the UK are more likely to be economically inactive on grounds of disability than in most other developed nations, suggesting far greater emphasis must be placed on providing support, “reasonable adjustments” and other measures to accommodate people with disabilities in the workplace. Disability discrimination legislation must be effectively applied. • Older workers are less of a sickness problem to employers than the workforce as a whole. They are more likely to take periods of long-term sick leave, however, so sickness policies should allow time off to manage chronic health problems. • The Health and Safety Executive must be provided additional resources to develop advice, guidance and enforcement approaches tailored to ensuring the continued productive and healthy employment of older workers. • Impact of work on the health and employability of older women workers is particularly neglected. Ensuring statutory, research, employer and union strategies are age and gender sensitive is crucial to ensuring the “work ability” of older women workers. • The impact of health problems related to ageing, for example hearing loss and osteoarthritis, can be minimised if health and safety laws are observed and adequately enforced, minimising any work-related component or exacerbation of the condition. • The UK’s long hours culture and the intensification of work, with fewer workers expected to do more, is detrimental to both health and productivity. The cumulative harm caused by overwork is likely to disadvantage older workers. Employers should introduce sensible working hours practices, adhering to the Working Time Regulations, and should eliminate excessive work rates. The health and safety enforcement agencies should take action to ensure harmful and excessive working hours and work pace are eliminated. • Workplace injury and ill-health rates in older workers need explicit attention from statutory agencies including the Health and Safety Executive. Most of the major causes of work-related mortality and morbidity in the UK are more common in older workers. Work hazards lead to tens of thousands of premature deaths every year. • Occupational health is not just about the health of the worker. It is about the right to healthy and productive retirement. Poor working conditions are stealing healthy retirement years from workers. The three top causes of death in the UK – cancer, chronic respiratory disease and circulatory disease – all have a substantial, preventable, occupational component. Occupational health research and policy must not be limited to ensuring work remains healthy. Both must ensure full consideration is giving to minimising the impact of occupation-related injury and disability in retirement. • The UK has dropped down Europe's ranking from being the nation whose workers believed they were most likely to be up to their job at age 60, to sixth behind Germany, The Netherlands, Sweden, Denmark and Finland. • Employers are not doing enough to accommodate effectively an ageing workforce. More than 1 million workers are struggling to find employment because of their age. Employers are not providing the necessary training and flexibility to retain their existing older workers. • A new emphasis on occupational health, integrated into board level strategy decisions, is necessary to ensure long-term health problems caused by work are not treated as “tomorrow’s problem”. The problem is today; it is the price paid by the company, the worker and society as a whole that comes later. • Effective implementation of workplace age management strategies will required training of managers and supervisors and a new mind set, focused on maintaining the positive contribution of older workers. • Physical fitness in older workers is strongly related to continued fitness to work. Employers can support older workers remaining fit and healthy by providing time, resources and access to facilities for participation in healthy activities inside and outside the workplace. • Unions should develop policy on occupational health and safety and the ageing worker. At workplace level, older workers’ health and safety should be raised at workplace health and safety committees, and should be discussed with members. Terms and conditions negotiations should consider the impact on older workers. • Retired workers should not be neglected. Occupational health research must take full account of excess mortality and morbidity in former workers. Unions should investigate measures to maintain contact with retired members so the real extent of work-related health problems are recognised and acted upon, and affected retired members are provided the necessary support and compensation. At retirement age, the great majority of us are in full working order. We are living longer, and we are healthier longer. The average person in the UK can expect almost a decade in good health after the age of 65. Work, for most, is something older workers are willing and able up to and sometimes beyond the usual retirement age. Sometimes its only prejudice that stands in the way. But many firms are not making that effort. ‘Ready, willing and able’, an August 2006 TUC report,(2) revealed that more than a million workers from Britain’s post-war baby boom generation are struggling to find employment because of their age. Employers are reluctant to recruit older workers or provide the necessary training and flexibility to retain those they already have despite their desire to continue working, the TUC said in its report. According to the TUC, more than a third of the 2.6 million people aged between 50 and 65 who are unemployed or economically inactive would prefer to be working. Some 250,000 said they were looking for a job while another 750,000 said they would like to have one. The report attacks the idea that the post-war baby boomers are opting to retire early. It says only a third of those who retire early do so entirely voluntarily. A Sheffield octogenarian has had to give up work after sustaining a serious workplace injury. John Moffatt, 80, received a £5,000 out-of-court settlement from his former employer in November 2006 after suffering the shoulder injury at work. Myth Chronological age determines health and age brings illness and disease. Myth Getting older is associated with a loss of cognitive capacity. Myth Older workers have less physical strength and endurance. Myth Older workers tend to have poorer sensory abilities such as sight and hearing. Myth Older workers have more time off sick. Myth Older workers have difficulty adapting to change. Myth Older workers find it hard to learn new information making their knowledge and skills outdated. Myth Older workers have more accidents in the workplace. Myth Older workers are less productive. First findings of the European Foundation’s 2005 survey, published in November 2006, show that workers saying they believed they would be able to do the same job when 60 was at 63.5 per cent in the UK, just above the EU15 average of 61 per cent and the expanded EU25 figure of 58.9 per cent. This represents a significant slip down the rankings. The UK now trails behind Germany (73.6 per cent), The Netherlands (71.2 per cent), Sweden (69.7 per cent), Denmark (68.8 per cent) and Finland (65.2 per cent)(4). Of the EU15 countries investigated in the previous 2000 European Working Conditions Survey, UK workers were the most likely to believe they’d be able to do the same job at 60 years of age (60.3 per cent compared to an EU15 average of 53.9 per cent). By 2005, the UK had fallen to sixth in the EU15 ranking, in the middle rather than at the head of the pack. The European Working Conditions Survey 2005 involved interviews with almost 30,000 workers in Europe, including over 1,000 in the UK. Workers reporting they believed they would be able to do the same job at 60. Finland has led the way on measures to accommodate older workers through “maintaining work ability”, a project driven by the official health and safety agency. Professor Juhani Ilmarinen of the Finnish Institute of Occupational Health (FIOH) points out that regular physical exercise can keep a worker’s physical capacity “nearly unchanged” between the ages of 45 and 65. He says an older worker taking regular physical exercise is likely to be fitter than younger colleagues who have not exercised. However, the issue of disability cannot be dodged if a strategy is to increase “work ability” of older workers. This is particularly true in the UK. It is not that older workers are not up to work. The TUC report says employment levels for men and women in the 50+ age group is higher than among 16-24 year olds. The UK has one of Europe’s highest proportions of older workers in work, trailing only Sweden and Denmark. The average age when UK workers leave the workforce is 63 years. And sickness absence rates in the UK, suggest if anything older workers are less likely to take sick leave. But the report says: “Employment outcomes are very closely linked to disability for older people. Compared to the average for both the EU and the OECD older people in the UK are more likely to be economically inactive because of disability, and this is especially true for men in their early 60s. An Occupational Medicine editorial in September 2006 by Professor Ilmarinen(8) called for a four step solution to “the ageing challenge”. • Attitudes towards ageing must be changed. • The knowledge level of managers and supervisors in age-related issues needs to be improved. • Better age-adjusted and flexible working life is needed. • Health care services should meet the increasing needs of older workers. The paper calls for action to address problems with management approaches and work hazards. Even where age does take a toll a person’s physical capabilities, it is prejudice and not problems that have made this an employment issue. The small deterioration expected with age is much smaller than the range of differences that exist across the entire workforce. An older worker whose eyesight and physical strength are not what they were, might still be fitter and more capable and than a day-one working teenager. 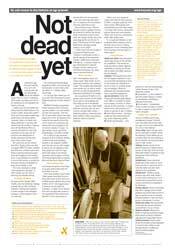 Occupational health researcher Simon Pickvance of Sheffield University told Hazards: “Much is made of how the ability to work declines with age. Physical strength, stamina, eyesight, hearing, for example, certainly do decline. But the key thing to remember is that in most cases, the average decline is by a few percentage points over the last 15 years of working life, but the range of performance amongst younger workers is much larger; looking after most young workers will also accommodate most older workers too. Some problems, like occupational deafness, can be compounded by an age-related deterioration in function. The same is the case for osteoarthritis, resulting from general wear and tear on joints – the attrition caused by excessive manual handling could change this from aches and pains to disability. However, noise induced hearing loss is easily preventable – and given most of us will suffer hearing loss it is something that can and should be minimised. Manual handling can, properly managed, be undertaken with no risk, just by using the correct work methods, staffing levels and lifting aids. Laws place explicit duties on employers to address these problems. As we get older eliminating the preventable occupational component of these and other problems becomes an even more pressing concern. 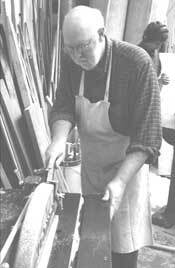 WOULD WORK After over 40 years of work, furniture maker Seán Thompson has no plans to retire. 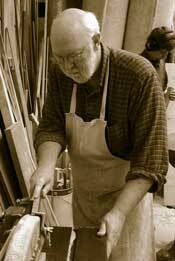 Self-employed, the London School of Furniture trained craftsman is now based in a share workshop. He says experience teaches greater caution and a less impetuous approach to work, but age has its disadvantages as all the aches and pains accrued throughout life begin to show themselves. Seán reckons his workshop benefits from young and old working together. The apprentice, Sam Bourn (rear), can get problems solved and advice from Seán and other older workers. Seán, who has a bad back, gets help with carrying and lifting. Work hazards lead to tens of thousands of premature deaths each year, robbing workers of years of life and frequently quality of life in their last years. HSE’s figures give a work fatal injury rate for men in the 55-59 age bracket of 1.7 per 100,000 workers in 2003/04, and a provisional figure for 2004/05 of 1.5. The equivalent male fatality figures for the 60-64 age band is 1.5 in 2003/04 and 2.3 provisionally in 2004/05. The fatality incidence for all employees was much lower at 1.2 per 100,000 for both years. The same pattern is seen for non-fatal major injuries. Non-fatal major injuries for women employees were similarly elevated. The report, ‘Trends and context to rates of workplace injury’,(12) suggests experience has a clear protective effect, with novices at greatest risk. It says: “In terms of employment tenure, we estimate that: After correcting for exposure, those with current employment tenure of less than a month are almost 400 per cent more likely to have a workplace injury than those with 20 years or more experience in their current job.” The report showed in workers aged 20 and over, relative injury risk in general fell with age, and was lowest in the 45+ age group. But occupational ill-health is a much more significant cause of harm, and the longer you’ve spent in the workplace the more likely you are to be affected. Occupational cancer alone could account for at least 12,000 premature deaths each year, and possible as many as 24,000 deaths (Hazards 92). The great majority of these are in people in the 60+ age group. Work-related chronic obstructive airways disease could add another 6,000 deaths. The work contribution to the total circulatory disease toll could be over 20,000 deaths a year. Both conditions are heavily concentrated in the older population. Sheffield University occupational health researcher Simon Pickvance says: “Most health problems caused by work are more common amongst older workers. Breathing problems, aches and pains (back problems, RSIs), noise-induced deafness, hand-arm vibration syndrome. “Others, such as occupational cancer, have latencies from exposure to effect, or progress gradually. Some kinds of stress affect people with young families more than older workers – but others like burnout, coping with physical illness and caring responsibilities, fear of job loss or exhaustion affect older workers more. The top causes of death in the UK are the most common work-related health conditions - cancer, chronic respiratory disease, and circulatory disease - and the workplace is a substantial contributor to the overall mortality (deaths) and morbidity (sickness) from these conditions. All three are conditions that become an increasing problem with age. A November 2005 report in Hazards(14) looked at evidence from a wide-range of sources and estimated the workplace contribution to overall disease incidence (Hazards 92). More than one in three people in the UK will be diagnosed with cancer in their lifetime. One in four will die from cancer, almost threequarters of these over the age of 60. More than a quarter of a million people in the UK are diagnosed with cancer every year. The official Health and Safety Executive (HSE) estimate of the occupational contribution toll is based on a single, discredited, paper. Hazards last year(15) revealed a series of fundamental flaws meant this estimate fell between two and four times short of the real incidence (Hazards 92). One reason HSE is so far off the mark is the Doll/Peto report on which its estimate is based was limited to an analysis of deaths in those under the age of 65. Cancer is primarily a disease of the old – only 26 per cent of the deaths in England in 2003 were in people under the age of 60, so it is likely the great majority of occupational cancers would have been omitted from the figure. Occupational cancers by definition only occur in those of working age and above and, because of latency periods before the development of disease, many are likely to emerge in old age. We have an ageing population – as other causes of death decline more are likely to survive long enough to develop their occupational cancers. Hazards put the work-related cancer toll at between 8 and 16 per cent of all cancers. This would translate to between 12,000 and 24,000 work-related cancer deaths year and between 21,600 and 43,200 new cases, the overwhelming majority in people at least 60 years old. Colin and Sandra Dyal had just celebrated their 40th wedding anniversary when he died in January 2006. Colin had worked for over 30 years for Goodyear in the West Midlands. As an instrument technician, most of his working life was spent in the asbestos riddled boiler house, providing power to the large tyre plant. Colin was first told he could have the asbestos cancer mesothelioma in May 2002, and the diagnosis was confirmed in August. He was 56 (Hazards 94). Colin died just after his 60th birthday on 11 January 2006. Several thousand adults die of asbestos cancers in the UK every year. In 2004 the official death count from mesothelioma, just one asbestos cancer, was 1,969 cases. Because of the long latency period before the disease appears, most will be approaching or over retirement age when the disease is diagnosed. They are robbed of years of life and quality of life. TUC in 2002 warned that the health and safety of older women was being neglected. (16) It called on employers to ask older women workers about the risks they faced, and for occupational health researchers to become more gender aware. It also called for unions to encourage older workers to become safety reps (Hazards 78). A 2003 report from TUC on women and the menopause(17) said many women have jobs that could be making menopause related symptoms worse, and called for employers to provide better welfare facilities, rest breaks and more forethought and understanding (Hazards 82). There is also anecdotal evidence that women suffering from asbestos related cancers face a tougher battle obtaining compensation than men. And women’s work more commonly includes “emotional labour” and the related stresses and pressures of caring roles. Authors Lesley Doyal and Sarah Payne of the School of Policy Studies at the University of Bristol conclude that greater commitment to age and gender equality is needed in occupational health research, the organisation of work, workplace health interventions and in the framing of wider social policy if the needs of older working women are to be met. The Help the Aged/TAEN report says changes will be needed in the culture of the workplace if older women are not to be damaged by psychosocial aspects of their work. “This will involve giving them greater control over their working lives. It will also require more effective policies to facilitate the combination of working lives and care of dependants.” It says workplace health promotion activities can fail to meet the needs of older workers in general and older women in particular, problems that must be addressed. Patrick Grattan, chief executive of TAEN, said the report “highlights a neglected issue. There has been little research on the work and health of older people, and of older women in particular. And yet the need for extended working lives in the face of increasing longevity and ageing populations is not in dispute. “Employment amongst people in their 50s and 60s is rising, driven recently by a growth in the number of older working women. Today, 69 per cent of women aged 50-59 are in paid work and 12 per cent of women aged 60 and over. Health and safety HSE is clear that health and safety should not be used as grounds to exclude older workers. However, risk assessments should ensure they take account of the individual’s capabilities. They should not make assumptions about supposed capabilities or frailties. The management regulations require that risk assessments identify those groups of workers who may be particularly at risk (www.hse.gov.uk/risk). In some instances, this may mean giving particular attention to the needs of older workers. Other regulations covering chemical safety, manual handling, noise at work, computer use and personal protective equipment all include risk assessment requirements that should take account of the capability and needs of the workers undertaking the task, and should endeavour to wherever possible adapt the work to the individual, for example with regard to the design of the workplace, the equipment and the working methods (Hazards 44). Disability The Disability Discrimination Act requires employers to carry out reasonable adjustments at work to help people with disabilities to remain in work. Official figures suggest 45 per cent of people over the age of 50 have a disability as defined by the law (a long-term health problem limiting normal activities for a year or more). Adjustments could include retraining, job redesign, offering an alternative job, changing working hours or providing equipment. Reforms to French pension laws mean employers are now required to consult with unions on the reduction of the physical strains of the job. The legal changes, introduced in August 2003, set a three-year deadline for the consultation. Under the new system, both sides must meet at least every three years and discuss working conditions and human resource management issues, the skills of older workers and work-related strain. However, EWCO says this is the first time there has been an explicit requirement for action to remedy physical strain. Measures to address problems could include early retirement or new work organisation and safety measures to reduce risks. The TUC is calling on the government and employers to adopt measures to stop an ageing workforce being pushed out of jobs on to benefits and early pensions. TUC’s ‘Ready, willing and able’ report said the problem of an ageing workforce could not be solved just by raising the state pension age. That would simply push more older people onto benefits. Instead, it calls on employers to adopt “age-management strategies” to retain workers over 50, such as retraining and flexible working. * Requiring employers to survey their employees to establish the age profile of their workforce, and then consider with those workers and their representatives what policies would help workers to remain in employment for as long as they would want ideally. * Extending to all employees the right to request flexible working arrangements. This would challenge the assumption that flexible working is only for women, and enable workers coming up to retirement to “downshift” gradually. * A right to retraining for older workers, with paid time off work to learn new skills. Judicious subsidies could encourage employers to welcome this. * DWP advice on retirement planning, offered periodically, starting several years ahead of state pension age. * Partial retirement - the ability to move to reduced hours, and supplement lower wages with a part-time pension. Finland and Sweden have introduced part-time sick pay for workers suffering from long-term ill health - workers who have been off ill for a long time can return to pay on a part-time basis, and receive partial sick pay as well. On the other hand, it said flexibility can also entail a loss of job/income security that is vital to retirement planning. It can also entail increased work intensity leading to early burnout and premature retirement as well as a need to modify “fitness for work” models/parameters and to recalibrate workloads and hazard exposure limits for older workers given general health changes associated with ageing, especially in context of less regulated and longer working hours. The improving health and longevity in the UK population means the great majority of workers have no significant health impediments to prevent work up to the age of 65 and for many, where they wish, beyond. And the UK’s ageing workforce means these workers will be essential to business, the economy and wider society. Older workers, however, are being denied access to work on spurious health and even health and safety grounds. There is no credible reason for these exclusions. That is not to say that an age “blind” approach is required. Age does impact on capability and health status does change with age. A lifetime of exposure to workplace risks can take its toll too. However, these effects can be minimised and better managed. Specific measures at a policy and workplace level can help older workers remain healthy and productive longer. If government targets for increased employment of older workers are to be met, it will require new “work ability” approaches from employers, including occupational health and safety programmes and workplace level “age management strategies”. Greater government resources and support for these initiatives are necessary, at least until approaches are have been properly honed and established. There is a case for introducing an explicit legal duty on employers under the Management of Health and Safety at Work Regulations, requiring assessment of jobs to see that job tasks take proper account of the physical capabilities of workers, with a particular focus on older workers and any possible adaptations, job redesign, changes in work hours or schedules or reassignment that might be beneficial. The UK already has a similar safety regulation tailored to younger workers. (24) France has a law requiring periodic review of measures by employers to address the impact of physical strains at work on the employability of older workers, with an explicit requirement to remedy problems identified. Law or not, age management strategies should be introduced at a workplace level and must target “ageing” rather than just “older” workers. Planning occupational health interventions and devising job redesign or alternative work in good time, with policies looking at workers in the 45+ age group, will provide greater scope for creating suitable and healthy work transitions. Career structures should allow a shift to more suitable work, where necessary or desirable. The UK’s long hours culture and the intensification of work, with fewer workers expected to do more, is detrimental to both health and productivity. The cumulative harm caused by overwork is likely to disadvantage older workers. Employers should introduce sensible working hours practices, adhering to the Working Time Regulations, and should eliminate excessive work rates. The health and safety enforcement agencies, led by the Health and Safety Executive, should take action to ensure harmful and excessive working hours and work pace are recognised as genuine and illegal health and safety concerns and are enforcement and prevention priorities. Strategies must also consider gender issues. The health of women workers, and particularly older women workers, has been neglected in occupational health research, in preventive strategies and in approaches by statutory health and safety agencies. There are many gender-related workplace factors ranging from type of work, to health issues to work-life balance that should be considered when considering the employability of older workers. A new emphasis on occupational health, integrated into board level strategy decisions, is necessary to ensure long-term health problems caused by work are not treated as “tomorrow’s problem”. The problem is today; it is the price paid by the company, the worker and wider society that comes later. Effective implementation of workplace age management strategies will required training of managers and supervisors and a new mind set, focused on maintaining the positive contribution of older workers. Failure on the part of employers to make any efforts to accommodate older workers could constitute age or disability discrimination. Workers, unions and other advocates should make sure they use age and disability discrimination laws effectively to ensure employers at least meet their minimum legal duties. Extension to older workers of the “right to ask” for flexible working arrangements would enable older workers to consider alternative work patterns better suited to their capabilities and responsibilities, including the possibility of “sunsetting”, a gradual reduction in work up to retirement. Workers should not be denied safety or vocational training because of their age. Older workers are less of a sickness problem to employers than the workforce as a whole. They are more likely to take periods of long-term sick leave, however, so sickness policies should allow time off to manage chronic health problems. Physical fitness in older workers is strongly related to continued fitness to work. Employers can support older workers remaining fit and healthy by providing time, resources and access to facilities for participation in healthy activities inside and outside the workplace. Official health and safety agencies must be fully involved in overseeing implementation of ageing workforce policies and practices. The Health and Safety Executive (HSE) must be provided additional resources to develop advice, guidance and enforcement approaches tailored to ensuring the continued productive and healthy employment of older workers. Occupational health is not just about the health of the worker. It is about the right to healthy and productive retirement. Poor working conditions are stealing healthy retirement years from workers. Occupational health research and policy must not be limited to ensuring work remains healthy. Both must ensure full consideration is giving to minimising the impact of occupation-related injury and disability in retirement. Finally, health and safety and the older worker must be a core issue for trade unions. Unions should develop policy on occupational health and safety and the ageing worker. At workplace level, older workers’ health and safety should be raised at workplace health and safety committees, and should be discussed with members. All terms and conditions negotiations should consider the impact on older workers. Unions should also investigate measures to maintain contact with retired members so the real extent of work-related health problems are recognised and acted upon, and affected retired members are provided the necessary support and compensation. Has your workplace got an age policy? It should have. And it should make sure age is not an issue neglected by either the union or the employer. Union safety Make sure age policy and issues is not overlooked at safety committee meetings. Ensure safety reps are consulted about all issues relating to the recruitment, training and employment of older workers. Training Workers should not be denied vocational or safety training because of their age. Training should allow older workers to prepare for work that is appropriate to their skills and capabilities. Suitable work Career structures should allow older workers to move away from work that is a particular risk for them as they get older to work that uses their skills, experience and capabilities. Flexible work Flexible working practices may allow older workers to reduce their working hours, or to arrange their working hours around caring commitments or preparation for retirement. Examples would include “sunsetting”, a phased hours reduction in the years leading to retirement. Sickness absence Policies should allow time off to manage chronic health problems. Health and safety Risk assessments will always take into account particular susceptibility to injury or illness of individuals. Older workers who may have particular needs and susceptibilities must be consulted directly. Payment schemes Where pay is based on meeting production targets, these should not lead to disadvantage because of age-related factors. Work rates Are work rates and hours excessive and bad for health? Unions should ensure agreed work patterns are not harmful and do not lead to difficulties or disadvantage for older workers. Health promotion Opportunities should be provided to help employees to maintain their ability to work, through exercise or addressing physical health problems. Pension schemes Company pension schemes should not result in pressure to work longer hours in the years preceding retirement. Gender issues Have health and safety issues affecting older women been given specific attention? A gender neutral approach can neglect differences in the types of jobs and pressures faced sometime by women and men at work. Consultation All age-sensitive policies and issues should be negotiated with the involvement of older workers and union reps.
Worker involvement Unions should ensure older workers are properly involved and consulted on union and workplace matters. Retired members Safety reps should endeavour to ensure information on work-related ill-health suffered by retired members is collated, so the true extent of the problems caused by work is ascertained. Retired members should be provided advice and assistance about possible compensation claims for work-related ill-health. 2. Ready, willing and able, TUC, August 2006. 3. Health, work and well-being – Caring for our future. ISBN: 1-84388-608-4. HM Government, October 2005. DWP news release and full report [pdf]. DWP news release 19 October 2005. 5. Attitude not age, Employers’ Forum on Age, September 2005. EFA publications webpage. 7. Juhani Ilmarinen. Ageing workers, Occupational and Environmental Medicine, volume 58, page 546, 2001. 8. Juhani Ilmarinen. The ageing workforce - challenges for occupational health, Occupational Medicine, volume 56, pages 362-364, 2006. Table 11a: Injuries to men employees by age of injured person and severity of injury, 2003/04 - 2004/05p. Table 11b: Injuries to women employees by age of injured person and severity of injury, 2003/04 - 2004/05p. 13. Occupational ill health age statistics: Information sheet, HSE. 14. A job to die for?, Hazards, number 92, October-December 2005. 15. Burying the evidence, Hazards 92, October-December 2005. 19. Managing physical strain at work, EWCO news pages, 13 August 2004. Gilles M, Guérin F and Rousseau T, Réduire la pénibilité au travail (Reduce physical strain at work) in Travail et changement (Work and change), ANACT, No. 294, Feb/Mar 2004. [in French]. 20. Callaghan K, Francis M and Gorman D. Editorial: Age and employment, Journal of Occupational Health and Safety – Australia and New Zealand, vol.20, pages 291-295, 2004. 23. Hirsch B, Macpherson D and Hardy M, Occupational age structure and access for older workers, Industrial and Labour Relations Review, Vol 53 No 3, pp401–418, 2000. 24. Too young to die, Hazards, Number 95, July-September 2006. Age and working conditions in the European Union, European Foundation, 2003. Foundation Focus - Issue 2: Age and employment, European Foundation, September 2006. Employment in Europe, European Commission, October 2003. Summary document [pdf] or and full report [pdf]. ACAS Age in the workplace advice leaflet. ACAS helpline on 08457 47 47 47. Why should a workplace look at issues concerning ageing workers?, CCOHS factsheet, Canada, 2002. European Foundation ‘Ageing and work’ webpages. TAEN – The Age and Employment Network, 207-221 Pentonville Road, London N1 9UZ. Tel: 020 7843 1590.